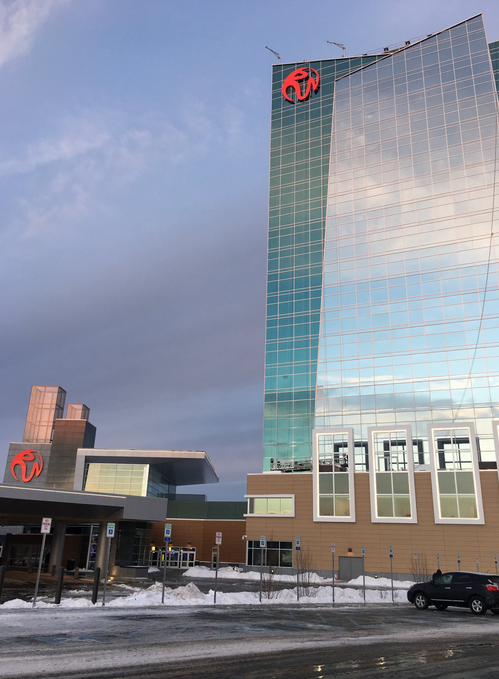 “The new Rivers Resort & Casino is a vital economic asset for the Capital Region, generating new jobs and opportunity, continuing Schenectady’s resurgence and moving the region forward," Governor Cuomo said. MARCH 2016 - Lt. Gov. Kathy Hochul and Schenectday Mayor Gary McCarthy on a CDTA bus tour of the Rivers Casino construction site. It took $330 million to build Rivers Casino & Resort in Schenectady. The gambling hall is celebrating its first anniversary today. In November 2013, 57 percent of New York voters approved a constitutional amendment backed by Governor Andrew Cuomo to expand casino gambling. A year later, three casinos were proposed for the Southern Tier, four in the Albany-Saratoga Region, and nine in the Catskills and Hudson Valley region. Eventually, Schenectady got the nod from the state’s Gaming Facility Location Board to transform a decrepit brownfield into a destination resort. Fast-forward to February 2017: "Today is just all good news. It really is a dream come true. We would be talking about this project sometimes and I would just say, it's just too great, it's just too unbelievable that something this grand and this powerful was going to happen, but it did. The dream came true, the vision turned into reality," proclaimed Cuomo. JULY 2016 - Rivers GM Mary Cheeks speaks with reporters on the casino construction site as Rush Street Gaming CEO Greg Karlin and NYSGC member John Poklemba look on. The "Rivers Casino & Resort at Mohawk Harbor" took 14 months from shovel to shuffle. "Welcome everyone to Rivers Casino and Resort," a smiling then-General Manager Mary Cheeks addressed reporters a week before opening day at the gleaming new gaming hall, which since has fallen short of projected revenue of $5.8 million dollars a year in gaming tax, which contribute to an 18 percent decrease in the city property tax. "We all know that didn't happen and there's no one to blame. Maybe the council for being a little too much, I guess, ignorant to the fact that maybe these numbers couldn't happen," noted Vince Riggi, an independent member of the Schenectady City Council. "The administration chose not to have a 'host agreement' with Rivers Casino, with Rush Street Gaming. So, that would have been a locked-in payment every year. And we ran a deficit in 2017 because we budgeted too much for casino revenue. We budgeted $2.75 million and it came in a little over 2. Stockade resident David Giacalone opposed the casino from day one: "The other number that is interesting is that Rush Street projected to the location board that it would make 181 to $222 million in its first year of operation. Instead of that figure it actually had a total of $129.2 million, which is significantly less than even the low end of that projection, and is probably why the general manager, Ms. Cheeks, was asked to leave a couple of months ago. We're in a situation now in which we don't know what Rivers Casino is thinking about its future. The failure to meet the projection might be why they brought in a new general manager, Rob Long, whose previous experience with Rush Street was to sell their very first casino only four years after it opened down in Mississippi in 2012, so I don't know if Mr. Long was brought in as an expert in looking for a new buyer, but that's a possibility." Rush issued a statement saying Cheeks had left to pursue other opportunities. She had been with the Chicago-based casino operator for seven years. Giacalone doesn't see Schenectady as a tourist destination and believes casino saturation is on course to overturn the higher revenue projections. "A $1 billion casino complex is opening in Monticello. If you look at the two so-called resorts, there's only one that looks like a tourist resort, and that's Monticello. There's no way on earth that ours does." The Schenectady County Legislature issued a statement congratulating Rivers on its anniversary, saying the county received more than $2 million in gaming revenue during the first year. 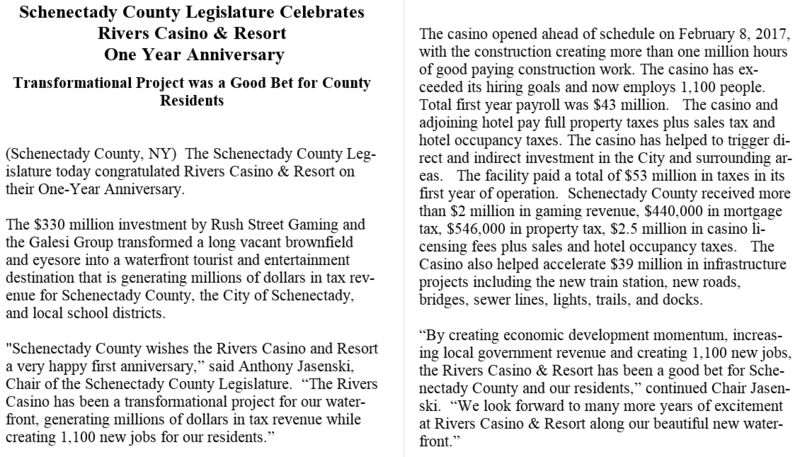 [Click to ENLARGE] The Schenectady County Legislature issued a statement congratulating Rivers on its anniversary, saying the county received more than $2 million in gaming revenue during the first year. "The facility paid a total of $53 million in taxes in its first year of operation. Schenectady County received more than $2 million in gaming revenue, $440,000 in mortgage tax, $546,000 in property tax, $2.5 million in casino licensing fees plus sales and hotel occupancy taxes. The Casino also helped accelerate $39 million in infrastructure projects including the new train station, new roads, bridges, sewer lines, lights, trails, and docks. " The state gaming commission and a spokesman for Rivers Casino were not available for comment. Rivers is celebrating its anniversary with a month of promotions. Details below are from an official press release. anniversary by throwing a month-long party filled with entertainment, promotions, and specials. Guests will also be treated to birthday cake on the property’s actual anniversary date, Thursday, February 8.
available through the Proctors Theater Box Office and through riverscasinoandresort.com. announced at 5:00 p.m. on February 7 on the Rivers Facebook page. On Saturday, February 10, the Rivers All-Star Bands will take the stage of the Event Center. Fan favorites who have performed throughout Rivers’ first year will return for one night of non-stop excitement, from 6:00 p.m. to midnight. Tickets are $20 and available through the Proctors Theater Box Office and through riverscasinoandresort.com. Rush Rewards guests will receive one complimentary ticket, available at the Rush Rewards Center. experience everything the Anniversary Weekend has to offer, from a bed and breakfast package, to resort credit packages of up to $100, to a romance package that includes a couple’s massage at Splash Spa, turndown service and a 4:00 p.m. checkout. Visit thelandinghotelny.com for details and to book a stay. All through Rivers’ Anniversary Month, Splash Spa will be offering a 25% discount to all customers who spend $50 or more on weekdays. Call 518-579-8855 for appointments. guest will be selected every hour to make a choice: select a briefcase full of cash (ranging from $1,000 to $3,000), or spin a prize wheel for a chance to win a Buick Encore. Guests will earn points for contest entries starting at 6:00 a.m. February 1, and will earn will receive 1 entry for every 10 points earned on slots, video poker or table games. Guests will earn double the entries by swiping their Rush Rewards card at a kiosk between 6:00 a.m. and midnight on Tuesdays and Wednesdays all month long. Entries can be activated starting at 5:00 p.m. on each drawing day. GM Birthday Cash Hot Seats – Prize Patrol – On Thursday, February 8, the property’s official anniversary, General Manager Rob Long and Assistant General Manager Justin Moore will be hitting the Rivers Gaming Floor to hand out cash from 4:00 to 6:00 p.m.
Thursday, February 15, will be eligible to receive a special Rivers Casino Anniversary Hoodie, or $15 in free slot play. Earning begins at 6:00 a.m., and guests can claim their hoodie (while supplies last) from noon to 8:00 p.m.
entertainment at Van Slyck’s from 2:00 to 5:00 p.m., complimentary coffee at Villa Italia from 9:00 a.m. to 9:00 p.m., and an all-you-can-eat soup and salad lunch special for $9.99 at Duke’s from 11:00 a.m. to 3:00 p.m. Rush Rewards members 55 and up will also have the chance to enter a Slot Tournament between the hours of 10:00 a.m. and 6:00 p.m. for a chance to win up to $750 in free slot play – $2,500 in free slot play will be given out every Monday. special Anniversary Cake on the casino floor from 6:00 p.m. to 8:00 p.m.
Big Game Party in Van Slyck’s – All Rivers guests are invited to watch Super Bowl LII from Van Slyck’s. The party starts at 5:30 p.m., and guests will be treated to stadium- style food specials, $2 beer specials and giveaways. Bud Light will be on hand to celebrate with fans with special giveaways and promotions. dining, spa and hotel stay specials. Couples are invited to A Taste for Love, a special Valentine’s Day event that combines a decadent dinner with a romantic evening of entertainment from singer Mia Scirocco. Doors will open at 6:30 p.m. and each lady will be given a flower upon entry. Dinner will be served and Ms. Scirocco will take the stage at 7:00 p.m. Tickets are $40 per person and are available through Proctors Theatre at tickets.proctors.org. highlighted by essential oils, chocolate scented body butter and oil and complimentary wine, all in a romantic setting complete with rose petals sprinkled around the room and scented candles. Call 518-579-8855 for reservations. Once the evening is over, couples can retire to The Landing Hotel, just steps away. For the month of February, couples can enjoy two special romance packages: The “Date Night Package” includes accommodations, a bottle of red wine, four Villa Italia cupcakes, breakfast in The Landing Hotel Bar for two and 2:00 p.m. checkout. The “Rivers Romance Package” includes all of the above, as well evening turndown service, breakfast in bed for two, a couple’s massage at Splash Spa and 4:00 p.m. checkout. Rock On, Rivers! With Rock-aoke – Channel your inner rock star on Thursdays with Rock-aoke at Van Slyck’s entertainment lounge. This live band karaoke event features live music from The High Rollers, with Rivers guests on the vocals. Every Thursday, from 7:00 to 10:00 pm. entertainment lounge is on Wednesdays from 7:00 to 9:00 p.m. The fourth and largest casino built in New York after state licenses were issued opened this morning. WAMC’s Hudson Valley Bureau Chief Allison Dunne reports from Resorts World Catskills casino in Sullivan County. Public perception of casinos among upstate New Yorkers continues to evolve. While new gaming halls will be built, people have become more aware of the long-term positives and negatives they'll bring to surrounding areas. A Time Warner Cable News/Siena College Poll out Monday finds a majority of those polled favor building a Capitol Region casino. Debate over the locations of casinos in New York has intensified. Several municipalities are mulling over the issue. Many communities across New York are talking about building casinos. Reactions have been mixed. In Saratoga Springs, home to a Racino, the city council came out against "upgrading" to a casino model, prompting developer Saratoga Casino And Raceway to look to places like Newburgh in Orange County and East Greenbush in Rensselaer County as potential casino sites.